If you’re in Dublin Saturday, drop by our RoboSlam Robot Cafe and build your own bot. 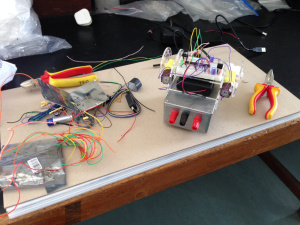 Ted’s robot design for Dublin Maker event on Saturday at Trinity College Dublin. Come build one for free! And, it’s just 12 Euro (less than the cost to us) if you want to take it home with you. This is just a quick reminder – it is only two days now to Saturday’s big event – Dublin Maker! The weather forecast is looking good so far – “cool and dry with scattered showers” according to met.ie. The event will open at 10am and run until 6pm. It tends to get busy at around midday. 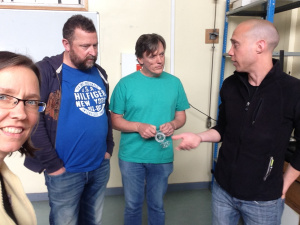 A description of some of the main participants at Dublin Maker 2015 is available here. Personally, we can’t wait to see what mechanical wonders Michal Mizsta the “dragon dude”, will have on show this year. And there is an interesting range of exhibits. Have fun! Sounds great that RoboSlammers, for a small fee, can take their robots home!